This Test Kit demonstrates the capabilities of our PCI Express over-fiber-optic solution, bringing the PCI and PCIe buses “out of the PC”. It is recommended for first-time users interested in exploring the advantages of our Adnaco-Sirius™ technology. 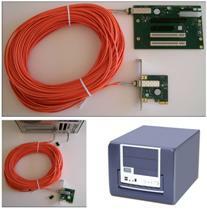 First word wide product provided PCIe over fiber optic extension and passed PCI-SIG tests. The Adnaco-Sirius-R1TK (test kit) provides transparent access to remote PCI/PCIedevices at 250 meters without compromising performance. Installation is simple and requires no additional drivers for the remote PCI/PCIe devices. The Test Kit’s remote unit provides two PCI slots, one PCIe x8 physical connector and another PCIe x16. Both PCIe physical connectors function as PCIe x1 slots suitable for remote connection of standard PCIe devices. An on-board PCIe-to-PCI bridge provides connection for standard PCI devices in order to support Legacy PCI devices. The fiber optic link is transparent to software applications and drivers, so industry-standard desktop computers and servers can communicate to remote PCI/PCIe devices (with no additional programming) via a full duplex link with data rates of 2.5 Gbps. The Test Kit’s remote unit comes in a rugged microATX case, with its own internal power supplies and cooling system, suitable for easy handling and deployment. Adnaco-H1: Standard, low-profile PCIe Host Adapter Card with standard fiber optic SFP transceiver. Adnaco-R1BP1-BOX1: PCI/PCIe Expansion Backplane Adnaco-R1BP1, with standard fiber optic SFP transceiver, in a microATX case. Power Supplies Included. FC1-50M Type Cable: Fiber optic cable, multi-mode duplex, LC-LC connectors, 50/125 µm, 50 m.
PCIUSBH1: 5 Port USB2.0 PCI Host Adapter Card with NEC chipset.